Here’s what’s up in the world of TV for Friday, July 15 and Saturday, July 16. All times are Eastern. 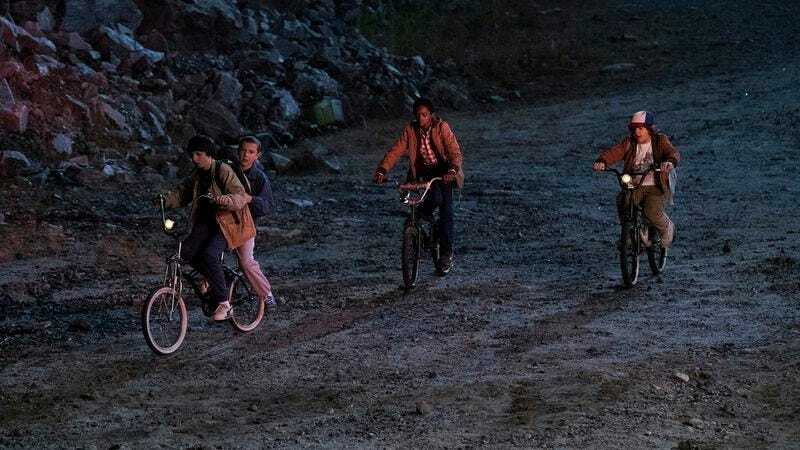 Stranger Things (Netflix, 3:01 a.m., Friday): From its John Carpenter-Stephen King title font on down, this 1983-set supernatural horror series isn’t shy about citing its references. There’s some Stand By Me, some E.T., some Close Encounters and Poltergeist, a touch of X-Files, maybe. But, still, this tale of a young boy’s mysterious disappearance, a secret government lab on the edge of the requisite small town where nothing bad ever happens, and some spooky goings-on (involving lots of flickering lights and the occasional levitating van) looks promising. Costars Winona Ryder and Matthew Modine add to the whole throwback vibe. Getting into said vibe, Emily L. Stephens has her Thomas Dolby album cued up and a pitcher of Midori Sours at the ready, so she’ll be your guide for the TV Club episodic reviews. They’ll pop out to scare you every other day starting Friday at noon. Meanwhile, in his pre-air review, Joshua Alston calls the show “stylish, beguiling, and eminently bingeable.” So, get bingeing, people. It’s not like there’s much else on out there. Secrets Of The Force Awakens: A Cinematic Journey (ABC, 8 p.m., Friday): Oh, you thought all the Force Awakens news, hype, and shameless shilling was over? You poor, naive, deluded little person, you. Here’s a thing about how they did all the things with the lightsabers and the laser beams and monsters and so forth. From ABC, the network owned by Disney, that made… The Force Awakens?! Man, it’s like they’re not even trying to hide it any more. Honeymoon From Hell (Lifetime, 8 p.m., Saturday) vs. A Perfect Christmas (Hallmark, 9 p.m., Saturday): In the Lifetime-Hallmark just-married TV movie wars, Lifetime goes dark, as a dewy newlywed couple is terrorized at a creepy bed and breakfast. By a madman. During a hurricane. Dang. Meanwhile, Hallmark takes the high gingerbread road as a dewy newlywed couple invites both their families to Christmas. Only, she’s pregnant! And, um, that’s a problem somehow. Advantage: Lifetime. Nitro Circus (NBC, 8 p.m., Saturday): Nothing says “the summer TV doldrums are here and your favorite TV Club writers are checking the couch cushions for change” than NBC giving over three hours(?!) to this “action sports collective” to vroom dirt bikes and Truckasauruses and whatnot all over its nice, clean network. East Los High (Hulu, 3:01 a.m., Friday): The fourth season premiere of this teen soap set at a mostly Latino high school. The show’s mix of telenovela twists and positive educational messages make it your new online Degrassi fix. Tony Robbins: I Am Not Your Guru (Netflix, 3:01 a.m., Friday): Shallow Hal costar and professional giant Robbins has spent his career saying exactly the opposite of what the title says, so this documentary has lots of explaining to do. In his pre-air review, Mike D’Angelo says this is basically a glorified infomercial, all the more shocking since it’s from Brother’s Keeper and Paradise Lost co-director Joe Berlinger. Eerie, Indiana (YouTube): If intrepid little kids investigating suspiciously ordinary small towns is your thing, then pair up your Stranger Things binge with this 1991 Twin Peaks-inspired supernatural show for the junior set. The short-lived series sees a streetwise New Jersey kid quickly realizing that his new Indiana hometown is hiding bizarre and sometimes frightening secrets behind its too-normal façade. Bigfoot, Elvis (who’s still alive), Captain Ahab (of sorts), and others all make appearances in Eerie, while the show plays around with breaking the fourth wall a few times, suggesting that its off-kilter reality is bleeding into our own.